Why Use Google Analytics Dashboards? Proactive store owners are on the constant lookout to optimize store performance and conversions. However, to optimize, one has to correctly measure e-commerce activity – meaning they must dig deeper into website analytics data. Monitoring analytics isn’t just for retailers with buggy sites. Most owners are constantly updating and changing their site’s components, which sometimes produces unexpected issues, so analytics are useful in catching problems caused by changes and help spot and resolve issues early. An example of a trouble that can easily go unannounced: a browser update that stumbles on a previously undetected checkout bug. In-depth conversion rate monitoring would instantly spot the loss of revenue and would have helped resolve it before the store lost customers. So, think about what data about your store you would like to have. It’s easier to get than you may think. The number of visitors, time spent browsing your products and their conversion rate into actual sales is are all great performance KPIs, but they are unlikely to help you generate actionable insights about what parts of your website need improvement. Don’t wait for a drop in revenue – let’s look into how you can use Google Analytics (the de-facto leader by far in web analytics) to get insights and identify issues early on. The first step in getting to know your customers is making sure that your website is prepared to share statistics with Google Analytics. Google Analytics setup is usually something that a webmaster does, but in case you are the one in charge there is a step-by-step guide to help you. Counting completed purchases is not really analytics – it’s keeping track of results. Ideally, you should keep track of all the major steps (or goals) of the customer decision points on your website. That will allow you to have a better grasp on the sales funnel and allow to compare users from different sources (including paid sources, a necessity when evaluating ad dollar spend); from users on different devices (to answer the question like: do your mobile users browse only for research, or for with the intention to complete the purchase on the desktop? ); evaluate your conversions on different browsers; etc. Store optimization often depends on accurate error detection, so keeping track of errors is a must have in early issue detection and proactive optimization. More about goals and events you should track can be found in this article. Browsing through the maze of all the available data within Google Analytics is very time-consuming, but can be drastically simplified with dashboard templates. The custom reports and dashboards are a quick way access key metrics. Once you’re logged into your Google Analytics account, follow the link to Google Analytics Solution Gallery’s e-commerce section. Google Analytics Solutions Gallery screenshot The best part is that these dashboards can then be customized and shared with your colleagues. You should experiment with dashboards that meet your needs best, so don’t hesitate to install several ones right away, as you will be able to modify and delete them as needed. If you are unsure which dashboard is the best choice for you, take a look at a review of 10 popular dashboards that can as easily be applied to your Google Analytics account. Monitoring your e-commerce website – and acting on insights generated by it – will ensure better customer satisfaction and a higher lifetime customer value as a result. 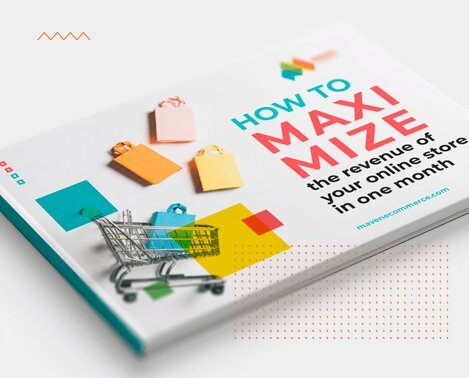 Using Google Analytics, setting up Goals, then installing and monitoring e-commerce dashboards will arm you with the tools to avoid the most common blunders and will help you get actionable information for your web store optimization. If you don’t have the time or the expertise for it, feel free to contact Maven to discuss a tailored proactive analytics monitoring and optimization plan for your business. We guarantee it will be money well spent.